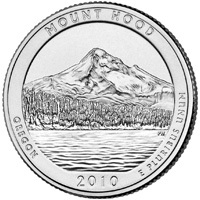 The Mount Hood National Forest quarter is the fifth of 2010 and the fifth overall in the America the Beautiful Quarters™ Program. Located 20 miles east of Portland, Oregon, which lies in the northern part of the Willamette River Valley, Mount Hood National Forest extends south from the strikingly beautiful Columbia River Gorge across more than 60 miles of forested mountains, lakes and streams, to the Olallie Scenic Area. The forest encompasses more than one million acres. Two of its many highlights are the Timberline Lodge, a national historic landmark in its own right, and the Clackamas Wild and Scenic River. Mount Hood was first established as a national site on September 28, 1893 (Pres. Proc. No. 6; 28 Stat. 1240). This reverse image depicts a view of Mount Hood with Lost Lake in the foreground. Inscriptions are MOUNT HOOD, OREGON, 2010 and E PLURIBUS UNUM. Design candidates were developed in consultation with representatives of Mount Hood National Forest.